Definition at line 39 of file lldrawpoolavatar.h. Definition at line 44 of file lldrawpoolavatar.h. Definition at line 50 of file lldrawpoolavatar.h. Definition at line 89 of file lldrawpoolavatar.cpp. Definition at line 188 of file lldrawpoolavatar.cpp. Definition at line 154 of file lldrawpoolavatar.cpp. References beginFootShadow(), beginRigid(), beginSkinned(), and LLVertexBuffer::unbind(). Definition at line 202 of file lldrawpoolavatar.cpp. References NULL, sShaderLevel, and sVertexProgram. Definition at line 224 of file lldrawpoolavatar.cpp. References LLShaderMgr::AVATAR_CLOTHING, LLShaderMgr::AVATAR_WEIGHT, LLGLSLShader::bind(), LLShaderMgr::BINORMAL, LLShaderMgr::BUMP_MAP, enable_binormals(), enable_cloth_weights(), enable_vertex_weighting(), LLGLSLShader::enableTexture(), gAvatarProgram, glClientActiveTextureARB, gMaterialIndex, gSpecularIndex, LLShaderMgr::MATERIAL_COLOR, LLGLSLShader::mAttribute, SHADER_LEVEL_BUMP, SHADER_LEVEL_CLOTH, LLShaderMgr::SPECULAR_COLOR, sRenderingSkinned, sShaderLevel, sVertexProgram, and TRUE. Definition at line 195 of file lldrawpoolavatar.cpp. References LLPipeline::enableLightsDynamic(), f, and gPipeline. Definition at line 173 of file lldrawpoolavatar.cpp. References endFootShadow(), endRigid(), and endSkinned(). Definition at line 217 of file lldrawpoolavatar.cpp. Definition at line 257 of file lldrawpoolavatar.cpp. References LLShaderMgr::AVATAR_CLOTHING, LLShaderMgr::AVATAR_WEIGHT, LLShaderMgr::BINORMAL, LLShaderMgr::BUMP_MAP, disable_binormals(), disable_cloth_weights(), disable_vertex_weighting(), LLGLSLShader::disableTexture(), FALSE, glClientActiveTextureARB, LLGLSLShader::mAttribute, SHADER_LEVEL_BUMP, SHADER_LEVEL_CLOTH, sRenderingSkinned, sShaderLevel, sVertexProgram, and LLGLSLShader::unbind(). Definition at line 604 of file lldrawpoolavatar.cpp. Definition at line 586 of file lldrawpoolavatar.cpp. References face, LLViewerObject::getTEImage(), LLFacePool::mReferences, and NULL. Definition at line 89 of file lldrawpoolavatar.h. Definition at line 127 of file lldrawpoolavatar.cpp. Definition at line 143 of file lldrawpoolavatar.cpp. Definition at line 61 of file lldrawpoolavatar.h. Definition at line 106 of file lldrawpoolavatar.cpp. Definition at line 99 of file lldrawpoolavatar.cpp. 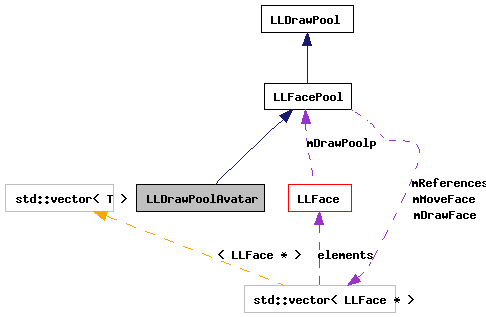 Definition at line 112 of file lldrawpoolavatar.cpp. References LLShaderMgr::getVertexShaderLevel(), LLDrawPool::mVertexShaderLevel, sBufferUsage, LLShaderMgr::SHADER_AVATAR, and sShaderLevel. Definition at line 148 of file lldrawpoolavatar.cpp. References LLFastTimer::FTM_RENDER_CHARACTERS, NULL, renderAvatars(), and t.
Definition at line 287 of file lldrawpoolavatar.cpp. References LLShaderMgr::AVATAR_GRAVITY, LLShaderMgr::AVATAR_MATRIX, AVATAR_RENDER_PASS_SINGLE, LLShaderMgr::AVATAR_SINWAVE, LLShaderMgr::AVATAR_WIND, beginRenderPass(), CLOTHING_GRAVITY_EFFECT, LLPipeline::enableLightsAvatar(), LLPipeline::enableLightsAvatarEdit(), endRenderPass(), f, gAvatarMatrixParam, gCamera, LLPointer< Type >::get(), LLFace::getDrawable(), LLCoordFrame::getMatrixToLocal(), getNumPasses(), LLJoint::getPosition(), LLViewerObject::getPositionAgent(), LLDrawable::getVObj(), LLJoint::getWorldPosition(), glBegin, glEnd, gPipeline, gRenderAvatar, gRenderForSelect, LLPipeline::hasRenderDebugFeatureMask(), i, LLViewerObject::isDead(), LLPointer< Type >::isNull(), LLViewerObject::mDrawable, LLFacePool::mDrawFace, LLDrawPool::mIndicesDrawn, LLVOAvatar::mIsSelf, LLVOAvatar::mPelvisp, LLVOAvatar::mRipplePhase, LLVOAvatar::mRoot, LLVOAvatar::mSpecialRenderMode, LLGLSLShader::mUniform, LLVector4::mV, LLVector3::mV, LLVOAvatar::mWindVec, noise1(), NUM_TEST_AVATARS, OGL_TO_CFR_ROTATION, prerender(), LLPipeline::RENDER_DEBUG_FEATURE_FOOT_SHADOWS, LLVOAvatar::renderCollisionVolumes(), LLVOAvatar::renderFootShadows(), LLVOAvatar::renderRigid(), LLVOAvatar::renderSkinned(), S32, LLVOAvatar::sAvatarLoadTest, LLAgent::sDebugDisplayTarget, LLJoint::setPosition(), LLVector4::setVec(), SHADER_LEVEL_CLOTH, sShaderLevel, LLVOAvatar::sShowCollisionVolumes, sVertexProgram, LLJoint::updateWorldMatrixChildren(), LLGLSLShader::vertexAttrib4fv(), VW, VX, and VY. Referenced by LLImagePreviewAvatar::render(), and render(). Definition at line 509 of file lldrawpoolavatar.cpp. References LLShaderMgr::AVATAR_MATRIX, AVATAR_RENDER_PASS_SINGLE, LLShaderMgr::AVATAR_WEIGHT, LLGLSLShader::bind(), disable_vertex_weighting(), enable_vertex_weighting(), f, FALSE, gAvatarMatrixParam, gAvatarPickProgram, LLPointer< Type >::get(), LLFace::getDrawable(), LLDrawable::getVObj(), glBlendFunc, glClientActiveTextureARB, glColor4ubv, gRenderAvatar, gUseGLPick, LLViewerObject::isDead(), LLPointer< Type >::isNull(), LLGLSLShader::mAttribute, LLViewerObject::mDrawable, LLFacePool::mDrawFace, LLDrawPool::mIndicesDrawn, LLVOAvatar::mIsDummy, LLGLSLShader::mUniform, LLColor4U::mV, LLVOAvatar::renderSkinned(), S32, sRenderingSkinned, sShaderLevel, sVertexProgram, TRUE, and LLGLSLShader::unbind(). Definition at line 42 of file lldrawpoolavatar.h.